You are the king (or queen) of your castle, so you may feel like you can do it all in your domain. You clean your own gutters, pressure wash your own driveway, and build your own closet shelves. You don’t need help! You just need the right tools and the Internet to lead you down the road to success. One of the biggest reasons that homeowners decide to handle their own termite pest control is that they want to save money. They can head to a home improvement store to buy the chemicals and applicator, and they don’t have to pay for labor. Another advantage to DIY termite control is that it is convenient. You don’t have to try to get on a termite company’s schedule or to coordinate around your work and family needs. You can do the work as soon as you are ready – in the middle of the night even. Despite the advantages, there are several drawbacks to trying to do this work yourself. You do not have the training or expertise to find the termites deep within your home and to develop the appropriate treatment plan. The chemicals used for termite control are also dangerous, and they pose a threat to you and your family if not handled properly. You have no warranty on the work you perform, and you have no protection if your property or your family are harmed by the chemicals. When you hire an exterminator in Phoenix, you may pay a little more money than you would doing the work yourself, but the primary advantage is that you are getting a trained professional who has all the tools and the knowledge to find all sources of termites in your home and to eradicate them safely and effectively. The exterminator knows exactly how to discover the termites in your home so that none of the pesky buggers will be left behind after the job is done. You can be sure that when the exterminator is done treating your home, all the termites are gone. The exterminator also knows how to use the chemicals for treatment safely so that you and your family are not harmed. In some cases, you may even be asked to leave the home so that you are not adversely affected. Because a professional does the work properly and safely, you actually end up saving money in the long run. By doing the work yourself, you risk having to pay for the chemicals and equipment over and over again to keep treating the house because you were ineffective the first time. You also risk spending a lot more money on repairs to your home thanks to the continued damage of termites you didn’t catch the first time. A termite company devoted to great service will also find ways to accommodate your schedule so that service is convenient for you. When you consider all the advantages of hiring a professional, there really is no need to do the work yourself. You’ll only risk causing yourself a lot more headache in the long term. 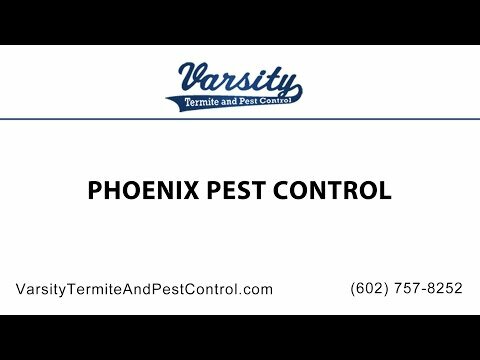 Varsity Termite and Pest Control is a respected termite company serving the Phoenix Valley Area in Arizona. We can get to the bottom of your termite problem and develop effective solutions to protect your home or business. We focus not just on termite pest control but also prevention. We do it all while striving to provide the best customer service and on a schedule that is convenient for you. We also treat for other common pests, such as scorpions, ants, roaches, and mice. Call us in Arizona today to learn why we are the termite company to help you.